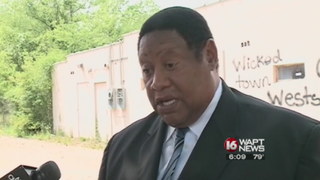 A Mississippi councilman who asked residents to throw rocks, bricks and bottles at police during what he considers racist car chases held a press conference Sunday to clarify his controversial statements. According to the Clarion-Ledger, Kenneth Stokes, of Ward 3 in Jackson, did not elaborate on his call to action but noted that police pursuits in his ward put lives at risk. "Race is a factor, and the blatant disregard for the public safety of innocent children and elderly citizens in unlawful chases by outside jurisdictions in the inner city of Jackson neighborhoods," Stokes said, the Clarion-Ledger reports. Stokes' earlier comments came after a high-speed chase through his ward Christmas Eve. According to the newspaper, some three neighboring jurisdictions joined in the pursuit of a suspect. Stokes called the neighboring law enforcement "thugs with badges" and said that while his ward is largely black, the surrounding jurisdictions are largely white and that pursuits of residents throughout the streets of Jackson feel race-related. Stokes added that he intends to ask the Department of Justice to investigate the number of police chases in his ward. Some members of the Jackson City Council and local authorities took issue with Stokes' controversial statements. "As president of the City Council, I can say unequivocally that Councilman Stokes' comments are indefensible and do not represent the Jackson City Council or the city of Jackson," Ward 2 Councilman Melvin Priester said in a statement. Madison County Sheriff Randy Tucker told the newspaper that he was investigating whether Stokes' comments warranted criminal charges. He also posted a warning to Stokes on social media. "Stokes…… I'm your huckleberry! Law enforcement will not be intimidated by you. Any Madison county law enforcement that is attacked because of your ignorant statements, I will hold you responsible. I fully intend to contact the MS Attorney General and inquire if your statements constitute assaults on officers by threat," Tucker wrote, AL.com reports. Rankin County Sheriff Bryan Bailey said that Stokes' comments were "ignorant," adding that officers are within their rights to follow a suspect into a neighboring community if they believe a crime has been committed in their county. "He [Stokes] said this is racism? Yeah, it is racism, against every officer, every deputy, anybody else that bleeds blue," Bailey told Alabama.com. Read more at the Clarion-Ledger and AL.com.